Siraf is an Ancient city in the Central District of Kangan County , Bushehr Province , Iran . 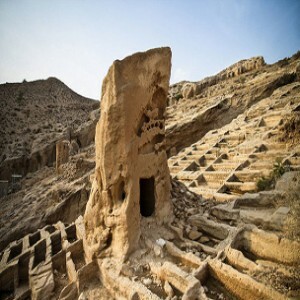 Siraf was according to a legend an ancient Sassanid port , destroyed around 970 CE , which was located on the north shore of the Persian Gulf in what is now the Iranian province of Bushehr . Its ruins are approximately 220 km east of Bushire and 380 km west of Bandar Abbas , 30 km east from Kangan city . Siraf controlled three ports : Bandar-e-Taheri , Bandar-e-Kangan and Bandar-e-Dayer . The Persian Gulf was used as a shipping route between the Arabian Peninsula and India over the Arabian Sea . Small boats , such as dhows , could also make the long journey by staying close to the coast and keeping land in sight .